More people are discovering Julian of Norwich and visiting her chapel shrine set up against St Julian's Church, in St Julian's Alley linking Rouen Road with King Street, in Norwich. Next door is the Julian Centre, selling books and cards related to Julian and offering a lending library on Christian spirituality. In the USA there is an Anglican religious order dedicated to Julian, its founder being Father John-Julian. Julian - it is not, of course, her real name — was born in 1342 into a world which knew three outbreaks of the Black Death in her early years. Norwich was especially badly hit. It is sometimes thought she was a married woman who lost her husband, and perhaps children, in the plague; more traditionally she is considered to have been a nun at the Benedictine convent in Carrow, half a mile from her cell. ​On May 8,1373, when she was 30, during an illness taking her to the brink of death, she experienced 16 visions centred on the life and Passion of Jesus. She became an anchoress, that is to say a woman living alone, dedicated to the religious life. Julian's cell would have had, as now, a window looking into the church, and another on to the road through which she would speak to people seeking advice. She would have taken her name from the church, which was then about 400 years old. No one knows when she died. 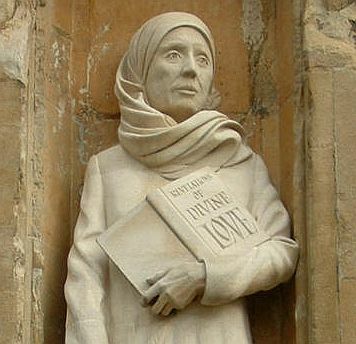 Julian meditated on her visions for 20 years before completing in 1393 her great book The Revelations of Divine Love, now regarded as a spiritual classic throughout the Christian world. She has been described as a true theologian, one of the two great theologians in the history of our country. A true theologian is one whose vision of God is true. She sees God, as far as a human being may, as He is, whereas we are generally off target, mildly or wildly, in our conception of God. Hers is the undistorted image. Since theology and our way of living are inextricably linked, our behaviour patterns are necessarily coloured by our picture of God. Hence the importance of Julian's message for our troubled world. Father Robert Llewellyn was a leading authority on Julian, and for many years chaplain to her shrine. In 1994 he received the International Templeton Award for his contribution to spiritual work in Britain, and in 1998 he was awarded the Cross of St Augustine by Archbishop George Carey at Lambeth Palace Chapel.